The flag is her flag of Tonga. I was only 26 years old when I found out I was pregnant, and I wanted a better life and future for the both of us since the father wanted no part of our future. He was too caught up with being young and did not want the responsibility. Too bad, I’m a strong independent woman. I grew up in Tonga. I came from a small village in Nuku’Alofa, and everyone treated each other as family. We all went to church and if we didn’t–well, that does not happen. I am the youngest of a family of six, five boys and I; I had a sister but she passed in 1944 off a ya’ te truck during the evacuation of Tonga. Tongan truck. This was a tragic event for my family, but us Tongans are strong. I went to a Catholic elementary school in 1955. In all the schools, they act with disciplinary action, so being hit and beaten for acting out was common sense. We practically were all family. In 1958, I went to a Catholic high school but didn’t finish and I transferred to a Mormon high school, a boarding school, and went home once a week to visit my family and go back. I graduated in 1965. I transferred because it was a better chance for a better education. I got my first job in high school. I worked in a copra board for two years before I graduated, and continued until 1970. I started to work to support my family because in the islands, you do not get paid as much as in the United States. Then I moved on to the Dateline Hotel and worked there as a bookkeeper. Then I left there in 1971, and went to New Zealand and back to Tonga a month later. I kept traveling between the two because I had more family in New Zealand, and I found a man. Then I went back to New Zealand and stayed there for a year and a half until I returned home in March 1973. I returned home after I found out I was pregnant and the man wanted nothing to do with us. All I thought on the way back was that he was a dumb pa’langi. White. I grew up with my two parents, whom I was very close with. 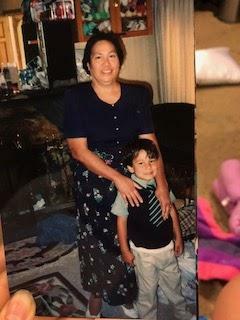 My teti (dad) was a very hard worker, and my mother stayed home and supported the family. I also worked many jobs to help provide for my family. Some things we did for fun was that my brother and I loved to go see movies on Saturdays and come home late and eat our favorite food. Curry. Which was made nice and warm for us, and our mom and dad would wait for us to come home. Even though there were a lot of us, they always loved us the same. We use to play hide and seek with our neighbors. And when we played with our neighbors, they would treat us so friendly and give us food. They use to make us all kind of foods such as puaka, lou, otai, and mahi mahi. Pig, spinach with spam, fruit drink, fish. The one major rule on Sundays in Tonga is that you have to go to church no matter what and you were never told twice. NEVER! Church was a very sacred time for us polys. If the teens thought it was cool to miss church, they would get a ‘slippa’ right across the back, face, man they got hit everywhere. Even the local markets were closed on Sundays until church was over. When I left, all I could tell my parents was ofa atu and malo for all of the things they did for me. Love you and thank you. I had to leave so my child could have a better life and a better chance of success. It was a hard decision, but I knew what had to be done, and the determination I had to have in order to be successful in California. I left for a new and better life. I wanted new things and a new life because I knew I was pregnant. And the father was not in the picture; he left when he found out and I hadn’t thought of him ever since. All I wanted was a new successful life for my baby and I.
I came across an American. I was amazed that they gave me a whole chicken for dinner. I kept on telling myself this was a real pa’langi dinner. White. I was so happy, I told them malo so many times. I was shocked that the flight was only cost $248. Wei it was really only that much. The only way I could have traveled was being able to speak English, which luckily was already taught in Tonga. In Tonga, we usually spoke Tongan but we learned both languages, because of European settlers. My first job in America was working as a caregiver, and then I quit and worked at a alcoholic hospital to help them. It opened my eyes when I saw the paycheck of $285. Then I worked at Stanford and then they started to ask for a green card. And I started to get scared; they would send me back to Tonga. I thought to myself that wei (no translation) these pa’langi’s were going to send me back. So I decided to disappear from there out of thin air, and I got another job. At night, my baby was taken care of by a nice couple. Then my brother David came from Tonga and lived with us, and he took care of my son at night until I came back in the morning. David was a handful, he was a tae. Trouble maker. Always getting in trouble. 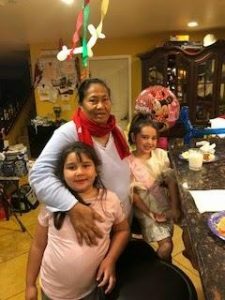 Some things I was blessed to do in California, because I worked hard and saved enough money to do, was being able to go to Disneyland and Knott’s Berry farm with my child and Lucy, my niece who came from Tonga. I also went to Six Flags and Great America, and I went to the Marine World a lot with my son. One thing I am proud to recognize is that I am a proud Polynesian. I know where I come from. When you know where you came from, you can be proud and feel accomplished, and you know your roots. Aurora with her eldest granddaughter, Marley. With her eldest grandson, Ericc. With her youngest grandchildren, Lilli in front, and Chloe in the back. 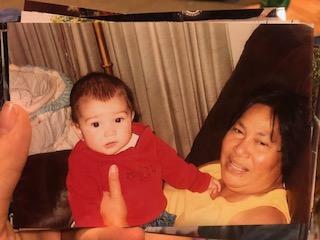 The story of Aurora Tuipulotu was written and recorded by her granddaughter, Marley Langi.